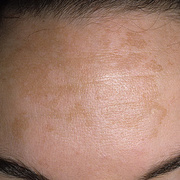 Melasma is a common skin problem. The condition causes dark, discolored patches on your skin. It’s also called chloasma, or the “mask of pregnancy,” when it occurs in pregnant women. The condition is much more common in women than men, though men can get it too. According to the American Academy of Dermatology, 90 percent of people who develop melasma are women. 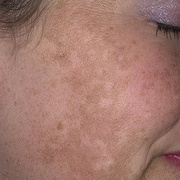 Melasma causes patches of discoloration. The patches are darker than your typical skin color. It typically occurs on the face and is symmetrical, with matching marks on both sides of your face. 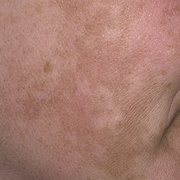 Other areas of your body that are often exposed to sun can also develop melasma. It can also occur on the neck and forearms. The skin discoloration doesn't do any physical harm, but you may feel self-conscious about the way it looks. If you notice these symptoms of melasma, see your doctor. Your doctor might refer you to a dermatologist, who is a doctor that specializes in treating skin disorders.